321 at the Shores is your home away from home. It's been remodeled with travertine marble bathroom, vessel sinks, bamboo flooring, new kitchen counters, etc. 321 offers FREE early check in and Late Check Out as late as 7:30 PM as per scheduling. My policy is to refund rent payments to the extent that reserved dates that are canceled are then re-rented to other guests. 321 has a private FREE, RESERVED parking spot by the entry walkway. Because of its location as a top floor, end unit 321 is exceptionally quiet and also enjoys stunning panoramic views. 321 also has FREE High Speed Internet and FREE Long Distance Phone Calls to the mainland US and Canada. 321 has HDTV in the living room and bedroom and a NetFlix connection and many movie DVDs and Hawaiian music CDs. 321 is exceptionally well equipped with snorkels, fins and lots of other beach gear, tennis rackets (on site tennis courts and exercise gym), a fully equipped kitchen, A/C and clothes washer and dryer. 321 is a top floor unit in a luxury, gated resort with convenient gas barbecues close by and is next to 'Anaeho'omalu Bay ('A-Bay') along the Kona/Kohala Coast, where you can enjoy the Pacific Ocean at its finest. 321 is over 1200 square feet in area and furnished with Polynesian style furniture and decorated with numerous Hawaiian art prints by local artists. **PLEASE SEE REVIEWS BY OUR GUESTS AT THE END OF THIS SECTION. At 'A Bay' you can snorkel, swim, or just play in warm tropical waters along coral reefs, or stroll along its mile long white sand beach, lined with coconut palms, next to ancient royal Hawaiian fish ponds with the 13,000 foot Mauna Kea and Mauna Loa Mountains as a backdrop. At 'A-Bay' you can take a daytime or sunset sail, see tropical fish from a glass bottom boat or spend time on a whale watching cruise. 'A-Bay' is just a seven minute walk or just a one minute drive away. The grounds at the Shores are truely beautiful with a lush landscaping of tropical trees and flowers surrounding waterfalls and lagoons. For those reasons it is the most requested one bedroom at the Shores. It's the perfect spot for anyone who wishes to experience the warmth and beauty of Hawaii in a quiet and relaxing atmosphere. 321 is centrally located for exploring all of the Big Island including the volcanoes, quaint old sugar plantation, and cattle ranching towns. 321 is close to beautiful beaches, championship golf courses, fine restaurants, great shopping, sailing cruises, horseback riding, helicopter tours, hiking, fishing, diving, snorkeling, swimming with dolphins, and much more. 321 is just a 2 minute drive or a 10 minute walk along a beautifully landscaped walkway with waterfalls and tropical pools to the King's Shops and the Queen's Marketplace outdoor shopping delights with clothing boutiques, jewelry stores, gift stores, grocery stores, several fine restaurants and a food court. GOLF! GOLF! GOLF! As our guests you will receive discounts at the Waikoloa Beach Course and the Waikoloa King's Course. 321 is just a 3 minute walk to the first tee and the restaurant of the Beach Course and a 3 minute drive to the King's Course. 321 is your peaceful and beautiful 'home away from home'! 'A 7 day Hawaiian vacation with my two daughters proved to be utterly spectacular while staying at 321 Shores. In the early mornings, we enjoyed Kona coffee (or hot chocolate) while relaxing on the tiled lanai in comfortable, padded lounge chairs. 321 is very spacious with windows galore! Uniquely enough, you get a lot of privacy because 321 is an end unit located on the 3rd floor. 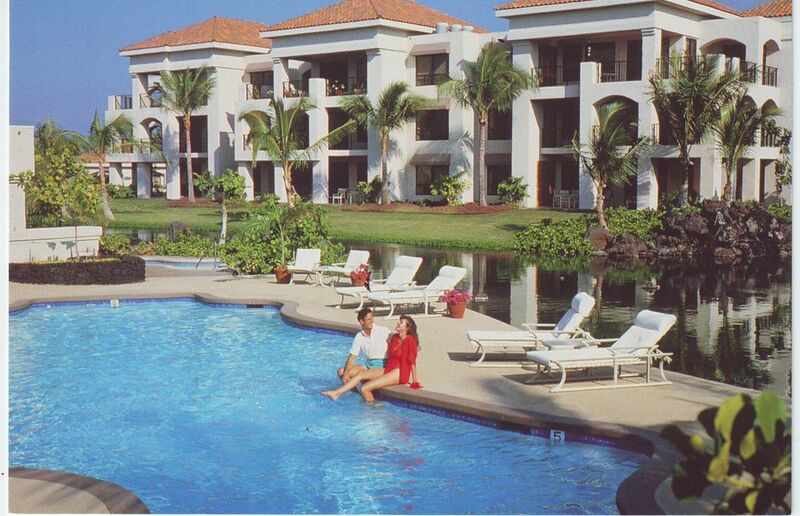 I enjoyed visiting the pool area at the Shores and taking advantage of the concierge services. I moved to the Big Island from California twenty years ago and I've enjoyed every day here. The many large or small private beaches, the mountains, the great weather, the ocean, racing in large or small Hawaiian canoes, snorkeling along the reefs, horseback riding, fishing along the coast or hiking in the mountains, performances at the Kahilu Theatre in Waimea, all the fine restaurants, the farmers' markets, there is always something new and different to do. I chose the Waikoloa/Kohala area for my home and the condos because of the great weather and the Waikoloa/Kohala beaches which are unsurpassed on the Big Island and certainly some of the best anywhere. I bought condos close to my home so that I can ensure that the condos and everything in them are in top condition at all times. Plus, I'm close by if needed for any reason, even if just to answer questions about the area or give directions, etc. I occasionally spend an evening or two at the condos because they're close to my home and to make sure that everything is as I would want it to be if I were a guest there. across the Waikoloa Beach Course. Watch sunrise over and sunset on all of the Big Island's mountains: Mauna Kea, Mauna Loa, Hualalai and the Kohala Mountains as well. (3) Phone in the living area AND in the bedroom AND in the kitchen, Answering Machine. central air conditioning in the condo. clothes washer and dryer are in the condo, in the laundry room next to the kitchen. Iron and ironing board in the condo. Reserved parking fr this unit!! The kitchen is fully equipped with every cooking tool a cook might want. Including coffee bean grinder, salad spinner, cake pans, rice maker, etc. and great views. dining set in inside dining area and second dining set on lanai. Large flat screen HDTV with DVD player in the living room. Large TV and DVD player in the bedroom. Many movie DVDs. NetFlix connection. (2) Large HDTV and DVD player in the living area. Also, Large TV/DVD player in the bedroom. Many movie DVDs. to review and see. NetFlix connection. Many top movies to watch when resting after a long day touring or at the beach. Beautiful pool with adjacent spa. FREE Late Check Out as late as 7 PM (as per scheduling). Great Views, New Gym/Exercise Facility, On Site Tennis Courts (tennis rackets and balls in the condo), Snorkels, masks, fins, boogie boards and other beach gear in the condo, Big Island Travel Books, Bathroom has Wall length Mirror, Side by Side Sinks, (toilet in separate room), hair dryer, iron and ironing board.